That old adage “You should have seen it last night” rang out clear last night. Bob and I went out about 5:50 PM and looked out across the Merrimack River from Eaton St. in Lawrence over the gated boathouse parking lot. 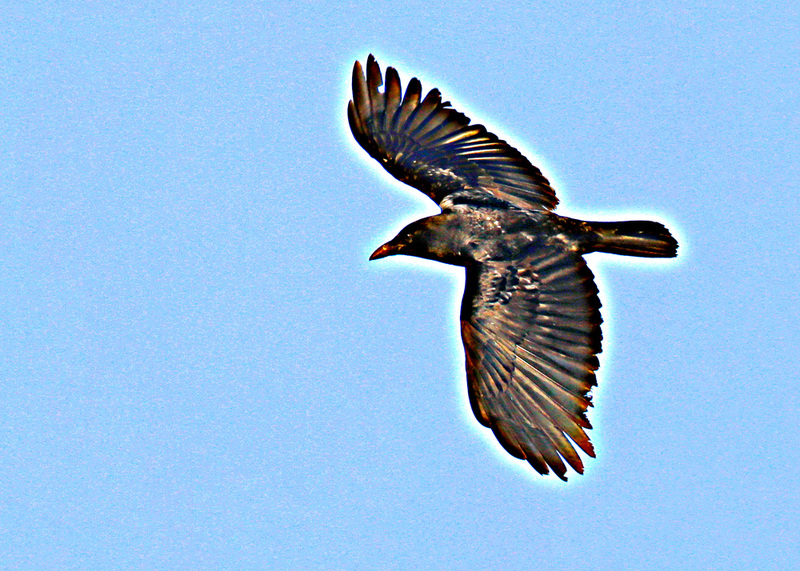 A few crows were moving west and a few coming in from the north headed to the south side of the river. In a few minutes, we drove back to Andover St. and west to Industrial Drive. The very large flat roofed New Balance Distribution Building (NBB) is straight ahead of you and Haffner’s Energy Building is to the right at the stop sign. 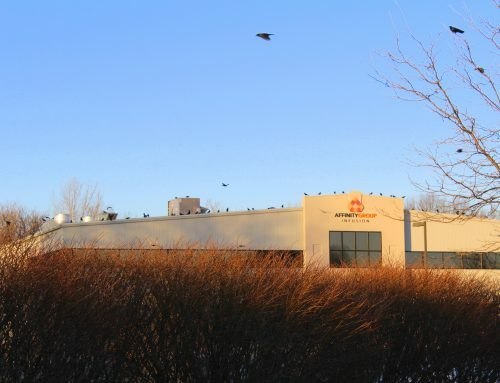 The birds were heading west over the NBB so we turned left and at the far end of the building we found crows staging to our right in the distant trees beyond the west gated parking lot, in the parking lot, on the road and on the ground on both sides of the marsh. Birds kept streaming in. As there was hardly any traffic, we just sat in the car and studied the birds. The vast array of American Crows (AMCR) calls are fascinating to me punctuated by a Fish Crow’s nasal call now and then. 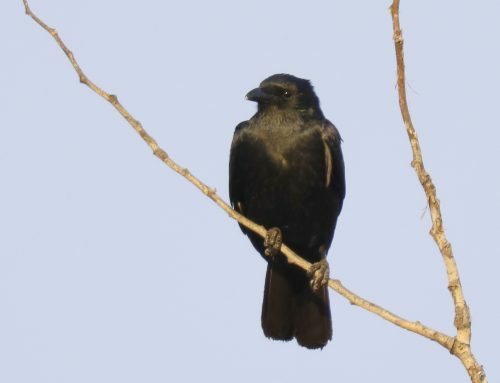 We are now getting very good at identifying the smaller, shorter legged Fish Crows with their different posture. There were a few white marked AMCRs with in the rump or secondaries. Was it just whitewash? They seemed to be trying to find small berries which had fallen from a tree with new gray-white buds. One AMCR sitting on the curb at the edge of the parking lot would bend down, puff up and pump as it gave a five-caw series repeatedly even continuing when the others had lifted and moved up to the trees. What was he saying? – of course, it was a he! The rattle call, the comb call and many variations of caws filled the air. Many crows began to sit on the roof of the NBB. Others would swirl around now and then and change where they perched. Soon they began to move into the trees to the south of the NBB. We turned around, moved to the east end of the tree patch and watched as the numbers grew. Now they started to gather on the flat roof of the building on the south of the street. We turned around and Bob started counting the birds in the trees and as they came off the NBB to sit in the trees, many began to sit of the other roof. 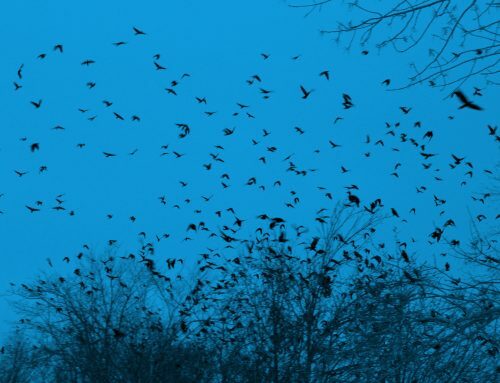 As sunset approached, masses of crows would lift and swirl around. We turned around again and faced east. 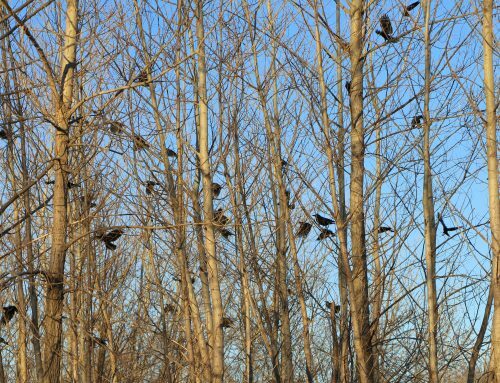 I was sure they would roost in the trees, but I was so wrong. Again, and again the different flocks- thousands of birds – would rise and settle down again on the other building, some on the snow and some in the trees. It was noisy. For thirty minutes this went on – they just could not make up their mind where they were going to roost. Why? 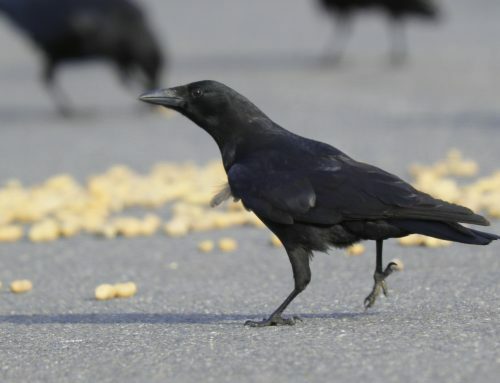 Which crows were leading this massive up and down, here and there? Questions but no answers. We have never seen them so agitated. Suddenly, decisively they all began streaming north over the NBB. We drove east to the open Haffner’s parking lot and could not see any crows to the rear of the NBB and could hardly hear them. It is DARK now. Off to the boathouse – no crows along the way or in the trees where they had roosted last night. I couldn’t see any across the river in the barely visible tree tops. I got out of the car, a few crows were calling nearby and suddenly high to the left swirling out over the road barely visible were thousands of crows. Never have we seen this – so undecided, so late. Where did they eventually roost? I suspect along the river to the west of us, but I’ll never be sure.